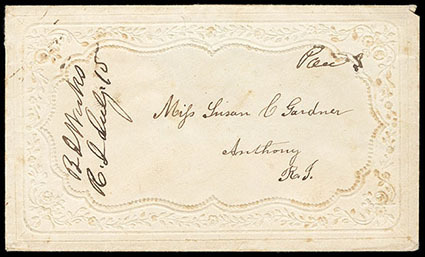 "B I Works, R.I. July 15" (Brand Iron Works), manuscript postmark with matching "Paid 3" rating on lady's embossed cover to Anthony R.I., Very Fine and scarce postmark. 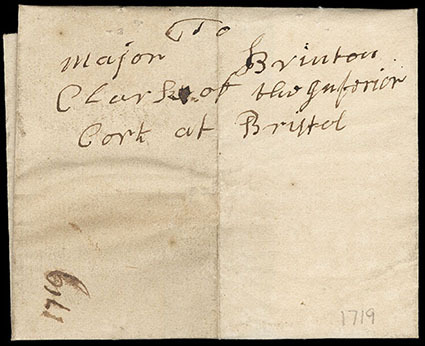 Bristol, R.I., 1709/10 (Jan. 10), letter "To the most worthy and honoured Judge - Byfield - in Bristol present" concerning a women abandoned by a man after marriage, who says if taken to court "he would kill that person that comes to take him", lovely handwriting, toned; second folded cover docketed 1719 and addressed "To Major Brinton, Clerk of the Inferior Cort at Bristol", Fine, an early pair of covers to Bristol. 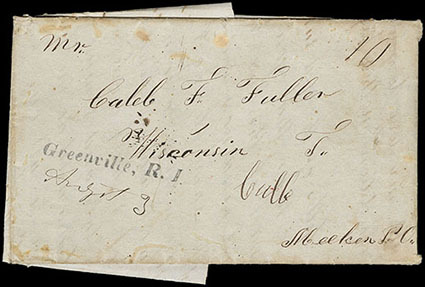 Greenville, R.I., two different straightlines on circa 1846 folded letters from Smithfield R.I. to Wisconsin Terr., first with "Greenville, R. I (comma after town and period after R of R.I.) with ms. "Augst 9" dating and matching "10" rating; second with "Greenville R, I" (only comma after R of R.I.) with ms. "Feby 3" dating and matching "Paid 10" rating; some staining on latter, F.-V.F. and scarce pair. 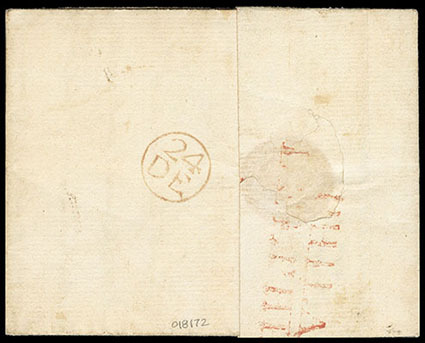 "Little Rest R.I., May 5", manuscript postmark with "12½" cents rating on part folded letter to Scituate Mass. ; light toning, Fine and rare town, Rarity S/R 9. 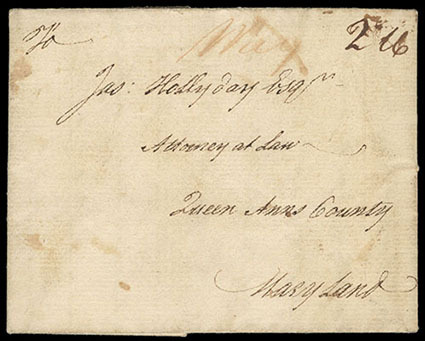 Newport R.I., 1772 (Dec. 11) to Queen Anns County Md. 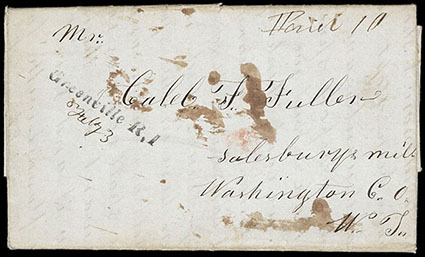 via Philadelphia, datelined folded letter entered mails with red "Phila / Delphia" two-line postmark and red "24 DE" Franklin mark on reverse, red manuscript "WAY" and "2 16" rating for 2dwt 16gr, Very Fine. A RARE PHILADELPHIA COLONIAL WAY LETTER FROM NEWPORT R.I. TO QUEEN ANNS COUNTY MD. "Newport 14. 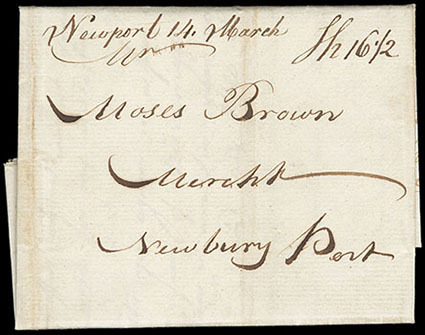 March", manuscript postmark and matching "Sh 16½" ship rating (12½¢ postage plus 4¢ ship fee) on fresh 1797 Moses Brown correspondence folded letter from Charleston S.C. to Newburyport Mass., letter from William Picket mentions "I am so unhappy on the Occasion that I feel unwilling to communicate it but not to keep you any longer in Suspense I must tell (altho so disagreeable) that your Ship William is so Rotten that she is unable to perform a European Voyage…Accordingly I am now preparing to return home to Newbury Port. 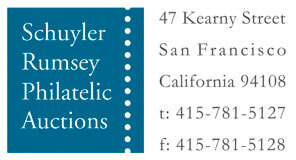 ", Very Fine; with 1997 A.P.S. certificate. 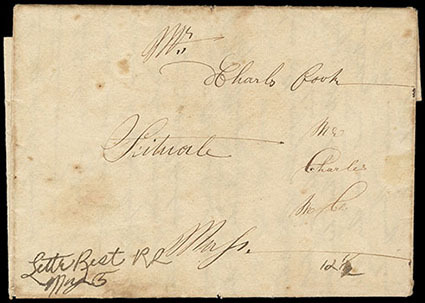 Newport, Rhode Island, Jul 16, fancy green oval postmark with matching smaller Old-English "FREE" rating handstamp on 1825 folded letter from Lieut. H.J. Feltus endorsed "On Public Service" to Genl. Thos. S. Jessup, Qr. 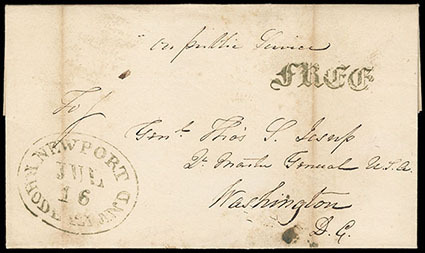 Master General at Washington D.C.; light folded toning, Fine and scarce Newport steamboat use. 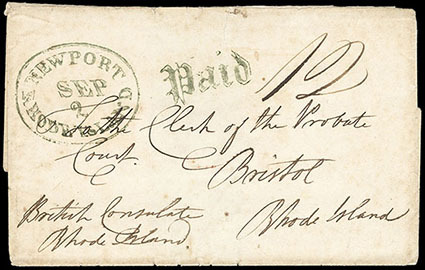 Newport, Rhode Island, Sep 2, fancy olive green oval postmark with matching smaller Old-English "Paid" rating handstamp and manuscript "12" cent rating on folded letter to Bristol R.I., endorsed "British Consulate, Rhode Island" at bottom left, flap with embossed British Consulate seal; reinforced edge tear and wear, some separation, Fine and scarce. 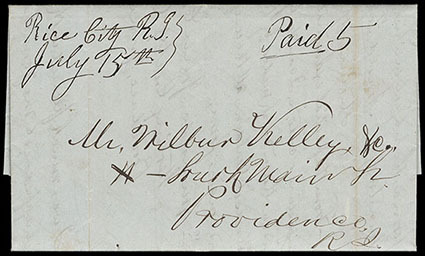 "Rice City R.I., July 15th", manuscript postmark with matching "Paid 5" rating on blue 1845 folded letter to Providence R.I., Very Fine and rare, Scarcity R8, ex-Thompson. 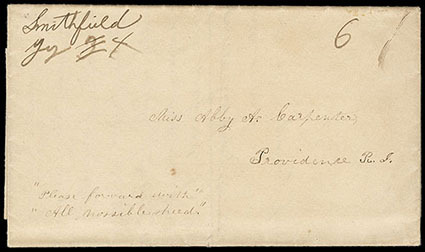 "Smithfield, Jy 4", manuscript postmark with day "3" crossed out and updated to "4", matching "6" cent rating on folded letter missing dateline page to Providence R.I., endorsed "Please forward with All possible speed" at lower left, Very Fine and scarce manuscript town, S/R 8.